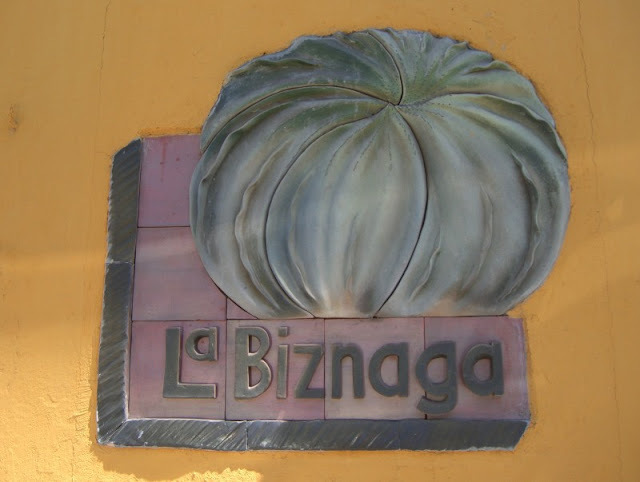 Based on a recommendation from a couple we met in Puerto Escondido, we had dinner one night at La Biznaga. Self-dubbed as a "Cocina Mestiza", La Biznaga serves up a slightly upscale take on Oaxacan cuisine. The setting is very nice - a spacious open courtyard with a retractable roof. We started with the "Trilogia Zapoteca" and the ""Ensalada Fresca". The Trilogia was a sampler trio of appetizers - a "Candela" (cheese and chile strips wrapped in Hierba Santa), a "Cerro Viejo" (a fried "corneto" filled with what tasted like caremlized onions) and a "Memela" (kind of like a sope, but bigger - topped with refried black beans). All were quite good, but one of each was enough. The Candelas and Cerros Viejos are available as individual appetizer plates and would likely be too much of a single thing unless shared with a group. The salad was a spinach salad with bacon, grapefruit and pecans and was lightly dressed with what tasted like honey. The flavors went very well together, and the bacon was nice and meaty. The appetizers and salad were enough food that we didn't have room for two full entrees. Instead we ordered a bowl of the "Sopa Azteca" (tortilla soup) and the "Pescado El Duranjo". The soup was a weak version that was not very well seasoned. The fish was a salmon dish that came covered in a spicy "burnt" tasting chile sauce with orange segments. The sauce was good, but very intense. The fish was served with rice, tortilla chips and guacamole. All in all, a very nice meal. We accompanied it with a few glasses of Chilean red wine (a merlot and a cabernet) that were both enjoyable and reasonably priced.